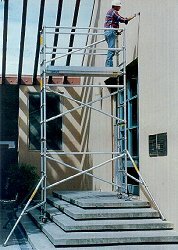 I remember the first time I was introduced to UpRight aluminum scaffolding. Ralph Cripps was the regional salesman for Upright and he drove up from Ohio to demonstrate the product. This demonstration pretty much entailed Ralph throwing the UpRight aluminum scaffolding across our parking lot and beating the braces on the ground like a gorilla. No matter what he did to that aluminum scaffolding, he couldn’t damage it. I was sold. My initial worry had been, “How can something so light be used to build scaffolding? Up to that point the only scaffold I had seen was steel. Not only was the Upright aluminum scaffolding strong, I was shocked to find that the tower had a much better feel than the steel when erected. There was virtually no sway! I was used to steel scaffolding which rolls and sways like a ship deck at sea. Ralph explained that this was due to friction and that the UpRight aluminum scaffold had seven times the friction of the steel. Over the years Ralph and I did a lot of demonstrations together and at that time UpRight salesmen were required to wear a suit and tie and I always got a kick out of watching Ralph take off his suit jacket and flip his tie over his shoulder and start building a scaffold tower.